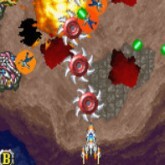 Description: Fever S.O.S (AKA: Dangun Feveron) is a DonPachi inspired game created by Cave/Atlus. This game is probably even more insane DonPachi. It has a sort of disco music and level theme lol, and the enemies are absolutely berserk and strange. Its weird when you're blasting bad guys and you see tiny human power up flying through the air? Or when you drop bombs and its like a giant disco concert. Yeah odd, lol. It's Not uncommon to see almost the entire screen filed with enemies in this game. If you are looking for strait unbalanced action this is the SHMUP to play! Game Controls: Shift Key = Insert Coin. Enter Key = Start. Arrow Keys = Move. "S, Z, X, C" Keys = Action Buttons. Select the option icons located at bottom of the game screen to edit controls, Play In Full Screen, Save/Load game progress, and change graphics settings.